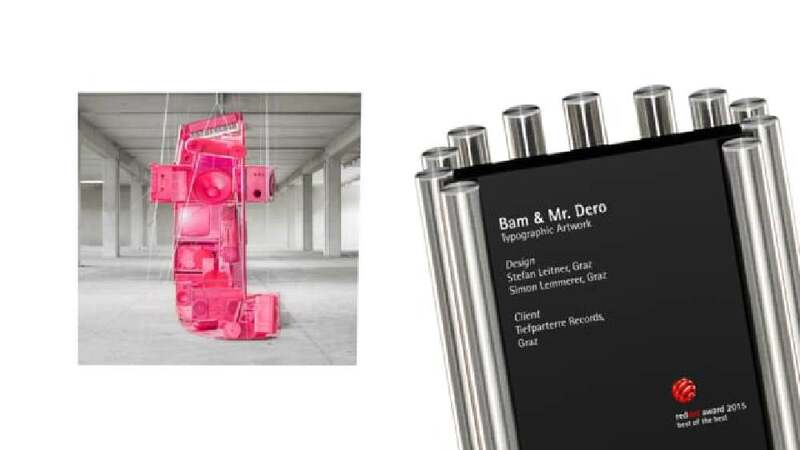 Bam and Mr. Dero were looking for an innovative visual concept for their upcoming double EP/LP “This” and “That”, together constituting the album entitled “This & That”. The idea was to create an anamorphic installation featuring the initial letters of the title words and the ampersand, and consisting of different colours and plotted letters. Old instruments and other music equipment were therefore rescued from the junkyard and picked up from collectors and music stores. The individual glyphs were then constructed by positioning the various objects in the room to form the letter “t” twice and the “&”, while different colours for each photo set, or each cover, were chosen. The majority of these objects were suspended from the ceiling with nylon threads. The letters were printed on tracing paper and placed in front of the camera. The objects were then positioned live on the camera screen and later placed in the room. Thus a complex installation emerged that possesses not only a distinctive graphical appeal but also works well as an album cover with a self-sufficient appearance. This work is an extraordinary example of how the music business, which relies on creativity, has come up with a highly innovative and playful idea. The way this installation skilfully turns various instruments and musical equipment into an elaborate spatial anamorphosis to express and visualise the identity and vision of the musicians has emerged as a highly convincing and visually outstanding implementation.